The Fifth BASIC Ministerial Meeting on climate change concluded yesterday in Tianjin, China. Members from all the BASIC countries participated in the Ministerial Meet including Environment Minister Jairam Ramesh, who represented India in the Meeting. In line with the “BASIC-plus” approach, representatives of Yemen, Chair of G77, Argentina, incoming Chair of G77, Ethiopia, Chair of the African Group, Grenada, Chair of AOSIS, and Egypt, Chair of the Arab Group were also invited and attended the meeting as observers. Ministers highly appreciated the successful meeting of UN Climate Change Conference held in Tianjin from 4th to 9th of October 2010, thus laying the solid ground for a good outcome in Cancun. The BASIC countries are a bloc of four large developing countries viz. 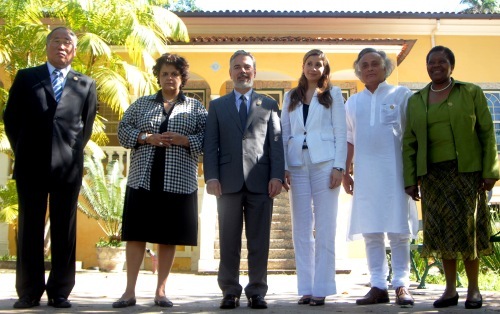 Brazil, South Africa, India and China formed by an agreement on 28 November 2009 just before CoP 15. These countries committed to act jointly at the Copenhagen climate summit last year, including a possible united walk-out if their common minimum position was not met by the developed nations. Now, with the CoP 16 in Cancun, Mexico around the corner, the meeting is being seen as a crucial one, towards a balanced outcome in Cancun. As was expected, the meeting was a preparation for Cancun with BASIC ministers focusing their discussions on issues related to it and expressed their determination to facilitate a comprehensive and balanced outcome in accordance with the mandate of the Bali Roadmap. It was felt that the Cancun Conference should be open, transparent, inclusive, party driven and based on consensus. It seemed however that not much is expected at Cancun (except ensuring its very much in line with the Bali roadmap) as the meeting saw it only to pave the way for a legally binding outcome next year in South Africa. A mid- and long- term financial support provided by the developed countries while urging developed countries to commit to more ambitious emission reduction targets under the second commitment period of the Kyoto Protocol is also being seen as the outcome of the Cancun conference by the BASIC countries. The developed countries obligation for technology support & transfer, funding, etc. was felt absolutely necessary for keeping global temperature increase well below 2ºC, bearing in mind that social and economic development and poverty eradication are the first and overriding priorities of developing countries. Equitable access to sustainable development was declared to be the core of and foundation for any climate change agreement and the prerequisite for setting up any global emission reduction target. Historical responsibility of developed countries, the need for space and time to achieve sustainable development in developing countries, and the need for the provision of adequate finance, technology and capacity building support by developed countries to developing countries were all felt as the immediate measures at the Meeting, for ensuring global equity. The Meeting also saw the Ministers rejecting the notion of unilateral actions against products and services of developing countries on grounds of combating climate change, including tax and non-tax, or other fiscal and non-fiscal border or other measures, which are incompatible the principles and provisions of the UNFCCC and are seen to seriously jeopardize international collaboration on climate change and international trade. With this declaration of the BASIC countries, what would go on during the negotiations at Cancun, Mexico is anybody’s guess. The Ministers also reiterated that the BASIC as part of the Group of 77 and China will continue to work and strengthen the unity of the Group, and play a constructive role in facilitating climate change negotiations. The “BASIC-plus” approach will be continued. Mr. Jairam Ramesh, who had earlier changed India’s “non-negotiable” stand at Copenhagen facing much opposition at home, now seems to be going with the flow with the other BASIC countries. What will definitely be of interest to many in the country is that India will be hosting the next, Sixth BASIC Ministerial Meeting on Climate Change shortly after Cancun in February 2011.